I actually didn’t read this book in the technical sense, I listened to the audio book. I think that reading this book as an adult has given me a slightly different perspective compared to when I would have read it as a teenager. As a teenager I am sure I could identify with the character of Abigail, with the idea that life isn’t fair, feeling hard done by and NO ONE really understanding her. As an adult, I found the Abigail a little bit annoying and whiney, this may have had something to do with the narration of the audio book, not that the narration was bad, but because it really brought the character of Abigail to life! This book has a little bit of everything, teenage angst, coming of age, history, time-slip, family drama, romance and a little touch of creepy. 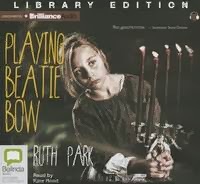 The creepy element again may have had more impact listening to the story as an audio book, but when the children are playing Beatie Bow and ….sees the little furry girl, it is quite creepy. One of the main aspects of my job is working worth schools and librarians, and the National Curriculum is now a big part of that. I now find it hard to read any historical Australian novel and not wonder how it would fit into the curriculum. This book does, and it doesn’t fit the curriculum in my mind. It does because it is a wonderful insight into everyday life of a family living in Sydney in 1873, it looks at the education, working conditions, lack of plumbing, expectations of females, the food they ate, jobs they had and even what it smelled like. The reason I don’t think it’s a perfect fit is because that part of the history curriculum is Year 4/5, and the book is probably too old for that age group. Most of it’s fine, but along with all of the interesting parts of history, there’s also the more seedy side to things, like when Abigail is snatched from the street and taken to a house of ill repute, where she’s told ‘ ‘tisn’t such a bad old life. Better than starving on slop work in the factories, any old how’ (page 90). It doesn’t actually spell out what these women are doing for money, but it’s worth noting if you plan to use it in the classroom. ‘I don’t think there are many ships,’ said Abigail. ‘We’ve got steam trains,‘ said Beatie proudly. ‘These would be electric or oil driven, I think, ‘ said Abigail, ‘and then a lot of goods come overland in huge semi-trailers…that’s a kind of horseless carriage, ‘ she added hastily. In re-reading all of the books for AusReading month, one of the things I have been considering is whether the book works as well today as it did when it was first published. This book is tricky, in that the part of the story set in 1783 absolutely stands up to any historically based novel written today, it's the part of the story set in present day that might not ring true with today’s readers. Present day in this book is 1980, so 33 years on, teenagers act and speak quite differently, so while 1980 might not seem particularly historical to some of us, teenage readers today may considered the whole books a piece of historical fiction! I only read this as an adult recently...and even though I was a teen in the 80's myself, I felt that section of the book was very dated and that Abigail was very annoying with her vintage clothes and attitude! I think your assessment is correct in that today's kids would read the whole book as historical fiction! PS I've added these posts to the Mr Linky on the Ausreading master post for you - I hope you don't mind?